The camapign claimed today that proposed legislation is worse than the UK system. The campaign launched today in the Alex Hotel. THE LOVE BOTH campaign, which is advocating a No vote in the upcoming Eighth Amendment referendum, officially launched its campaign today. Love Both has argued that the Eighth Amendment saves lives, and that Ireland’s current laws are responsible for creating an environment where unborn babies and mothers are both valued. While not the main group calling for a No vote, the group’s launch focused on the government’s proposal that abortion access would be unrestricted for the first 12 weeks of a pregnancy. Spokesperson Cora Sherlock said that the removal of the Eighth Amendment from the Irish constitution would result in a nationwide, GP-led abortion service on request for the first 12 weeks of a pregnancy. Love Both’s legal consultant Caroline Simons said that the proposed legislation will allow for abortion on vague grounds. Speaking to TheJournal.ie, Katie Ascough, former president of UCD Students’ Union, said that the government is proposing “a very extreme abortion regime” that was in many ways “more extreme” than the UK’s system. In the UK, abortions are legal up to 24 weeks into the pregnancy if there is a risk to the woman’s life, if there is a substantial risk that the child would suffer mental or physical abnormalities or if abortion is necessary to prevent permanent injury to the physical or mental health of the woman. The event in Dublin’s Alex hotel attracted six TDs: Fine Gael’s Peter Fitzpatrick, Fianna Fáil’s Eamon O Cuív, Kevin O’Keeffe and Declan Breathnach and independents Mattie McGrath and Michael Healy Rae. Speaking to TheJournal.ie, Sherlock said that the campaign’s message is “very simple”. It’s a simple option that’s on the table for people on 25 May. It’s either protect mothers and babies on the one hand, or introduce abortion on demand on the other hand. “The only way to prevent abortion on demand coming in is to vote no,” Sherlock said. 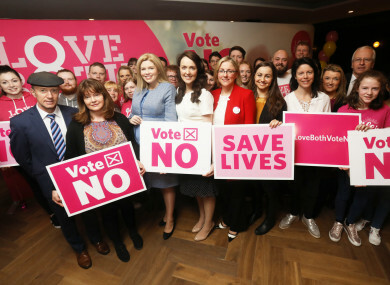 Both the Save the 8th campaign, the main campaign calling for a No vote,and Together For Yes, the main campaign seeking a Yes vote, were launched last month. Email “Love Both launches its referendum campaign and criticises 12 weeks proposal for abortion”. Feedback on “Love Both launches its referendum campaign and criticises 12 weeks proposal for abortion”.